I watched the spider weave this web. Watched the tiny dots hatch into tiny spiders. And then today, they emerged. It’s been a daily pilgrimage for me to check on the nest. I’m so pleased the web survived the farm tractors, dog walkers, stormy weather. I whispered good wishes to the babies as they drifted on the wind. And pondered on the things that make me happy. They are the simple pleasures in life. The things that money can’t buy. Wow, is it really web? I thought it was a net. Amazing shot. thank you. It was mesmerising watching the spider spin that web. And then all the tiny eggs hatch into miniature spiders. The best bit was watching them spin out tiny threads and let the wind blow them away. 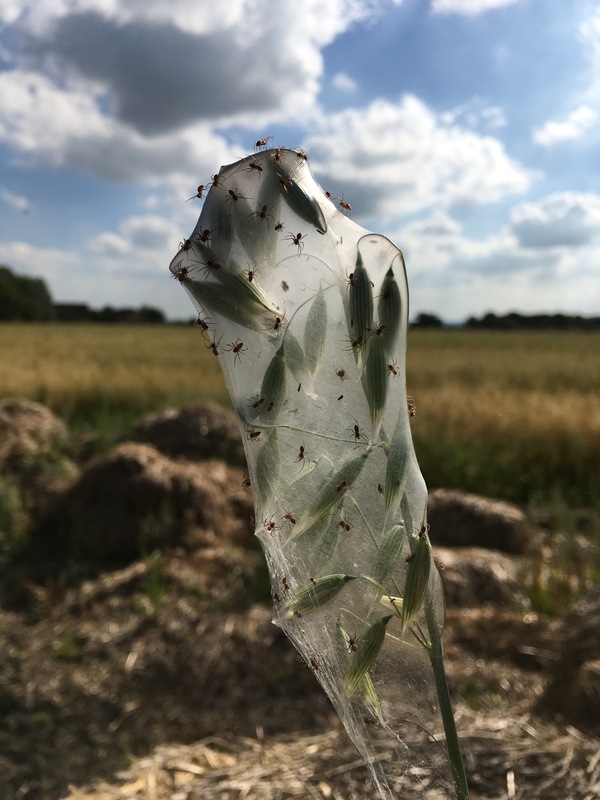 An excellent photo of the baby spiders. We once had something similar, attached to a wheelie bin. I had to disturb the nest on rubbish day, unfortunately. Oats…why oats…a nice spread, up in the air to catch the wind, perhaps bugs will try to eat the oats.